This cone is used to find out viscosity of Bentinite slurry and like material. The Marsh Cone is 6 inch in diameter at the top and 12 inch long, and tapers to join a tube 2 inch long and 3/16 inch inside dia. The capacity of the funnel is 1500 cc. Time in seconds required to flow out 1000 cc of slurry from cone is measured as funnel viscosity of the material. 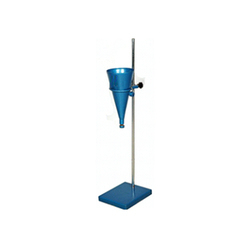 Glass Agencies EROSE are manufacturer of Mash Cone Funnel. 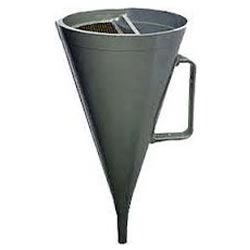 Marsh Cone Funnel - (MCF-01)This cone is used to find out viscosity of Bentinite slurry and like material. The Marsh Cone is 6 inch in diameter at the top and 12 inch long, and tapers to join a tube 2 inch long and 3/16 inch inside dia. The capacity of the funnel is 1500 cc. Time in seconds required to flow out 1000 cc of slurry from cone is measured as funnel viscosity of the material. Backed with our adroit team of professionals, we are able to provide our clients with an assorted gamut of Marsh Cone. This cone is used to find out Viscosity of Bentinite slurry and like material. The Marsh Cone is 6 inch in diameter at the top and 12 inch long, and tapers to join a tube 2 inch long and 3/16 inch inside dia. It is used in bitumen testing purpose. It consist of cone with 4.8mm dia. bottom hole & Stand. Stand has adjustable knob for setting the cone as per required high. This cone is used to find out Viscosity of Bentinite Slurry and like material.AIC-MCS-B1500cc. : MARSH CONE WITH STAND. DRASS. Marsh Cone with Stand The marsh funnel viscosity respectively the funnel flow time is the ratio of the speed of the sample fluid as it passes through the orifice to the amount of force that is causing the fluid to flow. The marsh funnel viscosity is reported as the number of seconds required for 1000 cm³ of sample fluid to flow out of a full marsh funnel. Suitable for measuring Cement admixture compatibility. This cone is used to find out viscosity of bentonite slurry and similar material. The marsh cone is 6 inch in diameter at the top and 12 inch long, and tapers to join a tube 2 inch long and 3/16 inch inside dia. The capacity of the funnel is 1500cc. Time in seconds required to flow out 1000cc of slurry from cone is measured as funnel viscosity of the material.